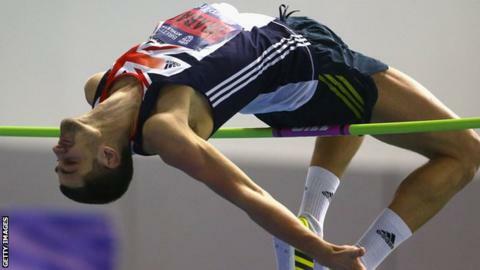 Olympic high jump bronze medallist Robbie Grabarz won the British Indoor title with a season's best effort. Grabarz, 25, comfortably claimed victory in Sheffield with a clearance of 2.31m before failing in an attempt to set a new British record. "It was only my second competition so to be jumping that high is pretty good," said Grabarz. There were victories for Margaret Adeoye (200m), Nigel Levine (400m) and Yamile Aldama (triple jump). Grabarz will now turn his attention to the European Indoor Championships in Sweden next month. "The target is to win in Gothenburg and I am looking forward to it," he added. "I've been training hard, I've not done too many competitions indoors so I know that when I come out I'm ready to go and today showed that." Elsewhere, world indoor champion Aldama won the triple jump, but the 40-year-old was disappointed with a winning distance of 13.44m. "It feels good to defend the title, winning is always good," she said. "I wasn't happy with the distance but I'm coming back slowly after the (shoulder) surgery that I had at the end of September." In arguably the most competitive event of the championship, Levine secured the 400m final in a 46.73 seconds season's best time. The 2012 winner and Olympic semi-finalist said: "I don't feel in that much kind of a shape but it is what it is. I'm happy to get another national title, my third time." Adeoye ran an impressive 23.22 secs in the 200m to finish in first place, ahead of Olympic 400m silver medallist Christine Ohuruogu, who honed her speed-work with a swift 23.58 secs season's best in second place. In the 400m, Eilidh Child, who set a new Scottish record of 52.06 secs in Saturday's heats, won the title in 52.13 secs. "It's been a great weekend for me," said Child. "I've had so many silvers at UK Championships before so it's great to finally get a gold." Fellow Scot Laura Muir, 19, also secured her place on the plane to Gothenburg with victory in the 1,500m.